We are so excited to officially introduce Zoey's Zoo. 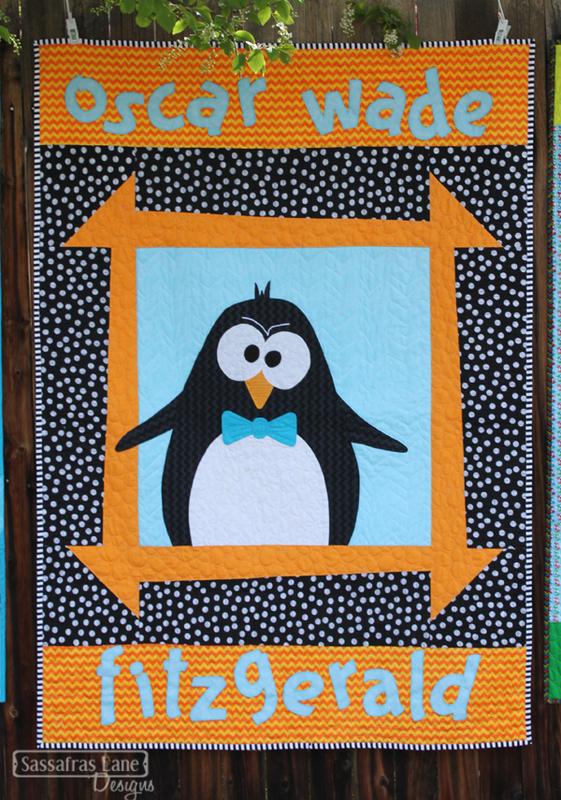 This pattern was a hit at Quilt Market in Pittsburgh and we are so happy we pushed to publish it just in time! 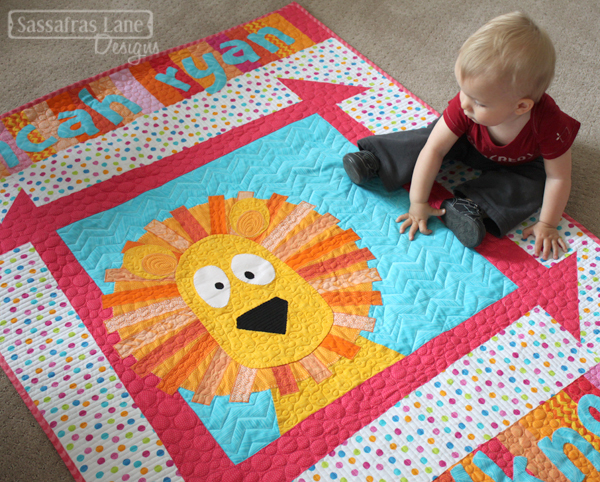 Zoey’s Zoo is a fun and quick applique pattern you can personalize for the newest baby in your life! With 4 different animals to choose from (A lion, bear, fox and penguin) you can find the perfect match in personality. The quilts finish 40” x 54”. Oh and did I mention that the pattern includes all four animals and the entire alphabet, full-size and reversed, ready to be traced! Meet Ms. Elliot the bear! Bears are normally masculine, but when we saw this pink retro camper fabric from Timeless Treasures, we couldn't resist making this bear an Audrey! She is a goofy character that is peeking her head around the corner! Say hello to Mr. Fitzgerald! This penguin cracks me up every time I look at him! 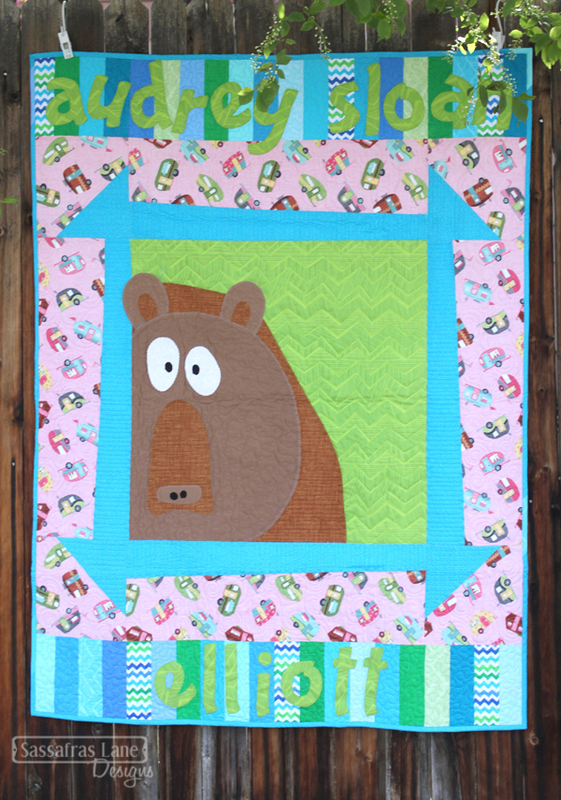 This little guy started off as a graphic I drew and it was so much fun to see him morph into a quilted character. 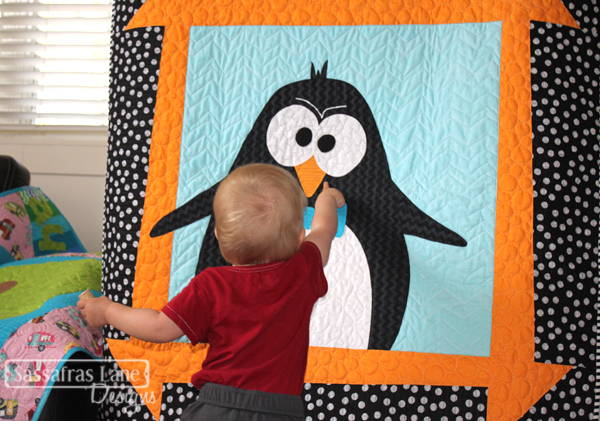 I love the color scheme we used for this one: black, white, aqua and orange! 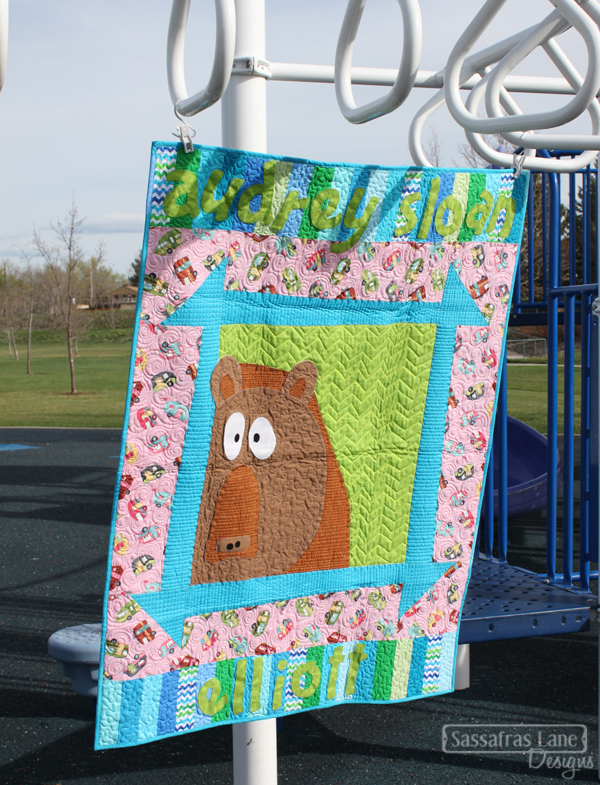 We also chose to use one fabric for the top and bottom borders instead of scrappy strips. Meet Mr. Cooper! 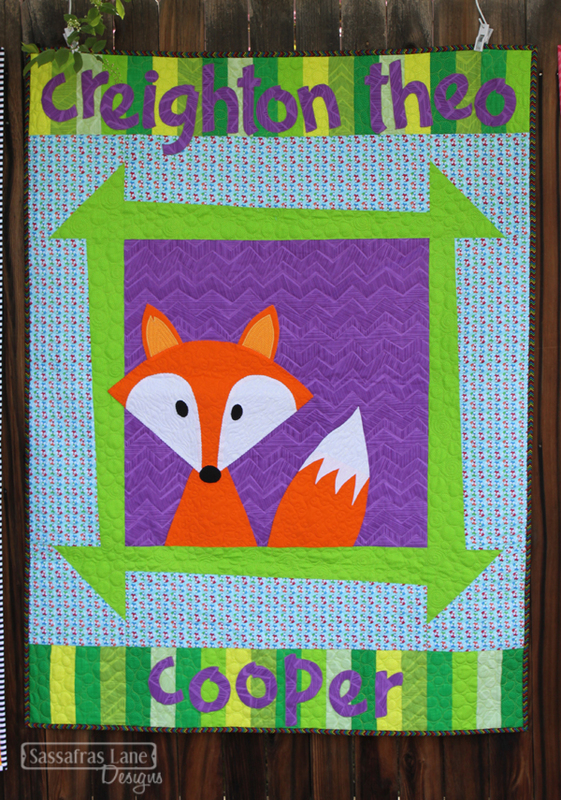 This little fox was the crowd favorite at Quilt Market. We heard, "What does the fox say?" more times than I could count! I love how contrast-y this guy turned out. He seems to pop off the background. 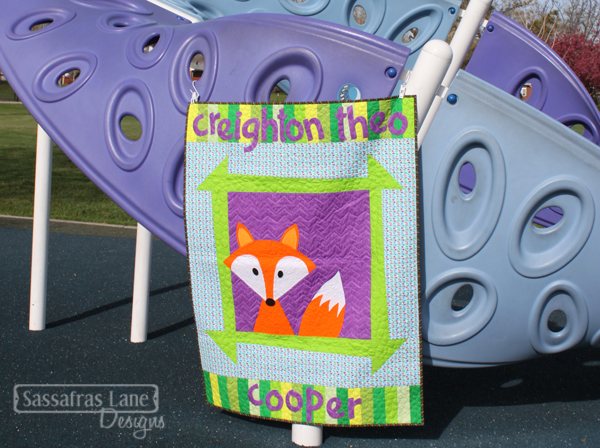 I also love the little fox border that surrounds him... yes, those are mini foxes! Say hello to Ms. Faulkner! 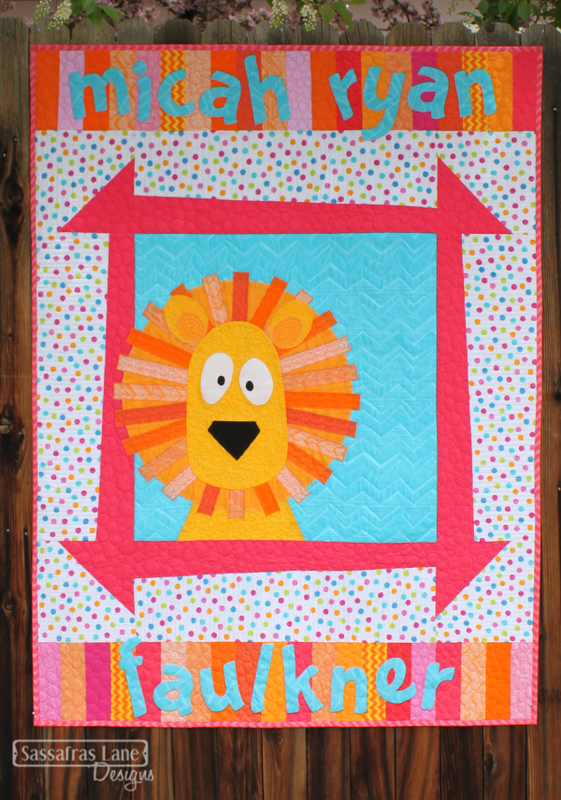 Now we know that female lions do not have manes, but we found the perfect bright girl fabrics for this little guy! This was a fun one to pull pinks and oranges for! You can make your mane as scrappy or solid as you would like. We opted to repeat 5 fabrics. We found the perfect sketch dot to use as the outside borders and I love how the aqua looks on those pinks and oranges! Choosing names for these little guys was tough! Most of these are combinations of family and friends names with a few random favorites sprinkled in! My Mom, the amazing talent that is Wolf Creek Quilting, quilted all of these quilt similarly, but gave each one it's own style. My favorite is the echoing of the zig-zag print background behind each animal. It is simple yet effective! 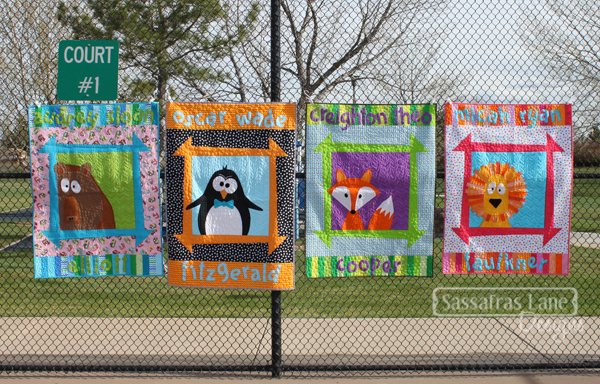 She used a mixture of serpentine lines, bubbles, stipple, swirls and loops to bring these animals to life! 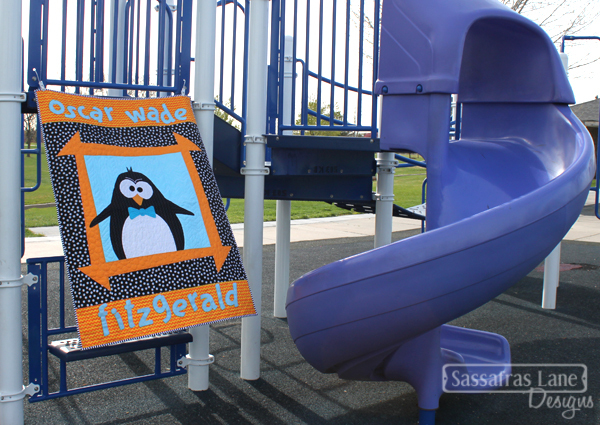 We took the Zoey's Zoo quilts to a local playground and got some fun photos on the slides, bars and climbing modules. The photo above at the tennis court. 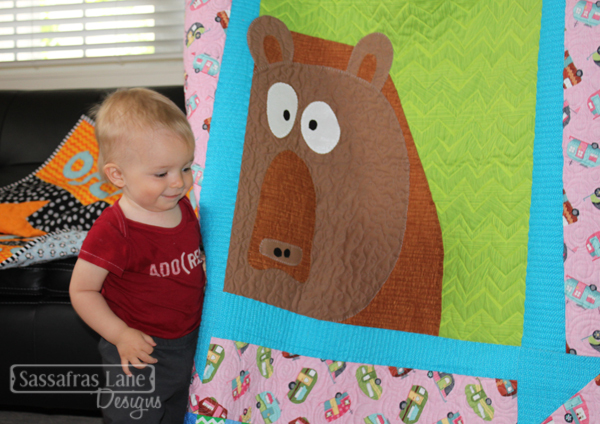 Big, huge, giant THANK YOU to Timeless Treasures for providing all of the adorable fabrics to create the Zoey's Zoo quilts. 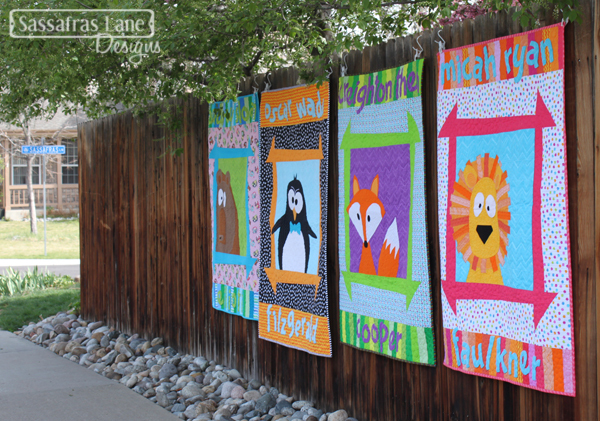 We used the Matilda Chevrons for all the animal's backgrounds, assorted Dream Dots for the churndashes, and Mini Foxes, Sketch Dots and Motorhomes for the outer borders. The animals and scrappy borders are a mixture of Sketch, Soho Solids, Dream, Chevrons, Rain Basic and Ziggy. 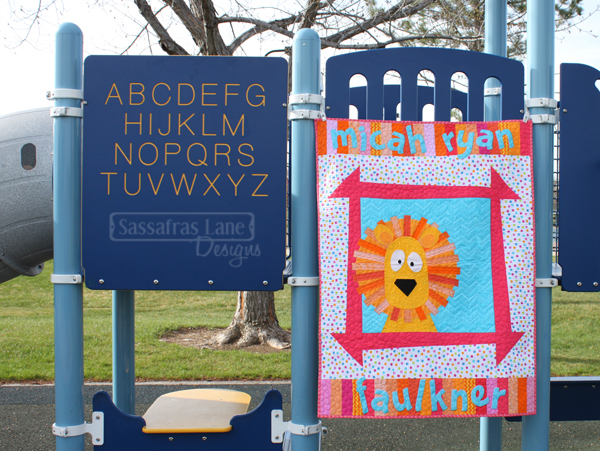 If you make this pattern or any other of our Sassafras Lane Designs patterns, send us an email! 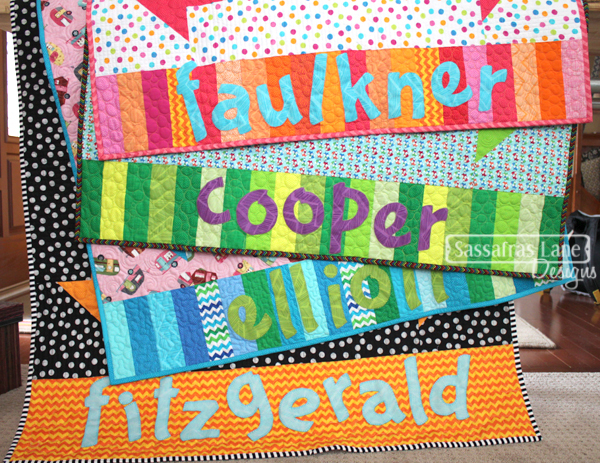 (contact@sassafras-lane.com) We would love to feature you and your project on our blog! 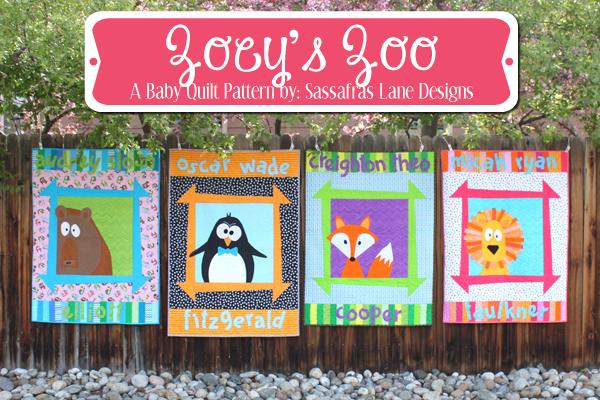 The Zoey's Zoo quilt pattern is only available in paper patterns. Because we have full-size animals printed, I am still debating whether or not to make them into PDFs. There would be a lot of printing and taping. Let me know if that is something you would like though! These patterns will be on sale starting tomorrow! Thank you for stopping by!